Amy Londyn in a scene from Eric B. Sirota's new musical FRANKENSTEIN. 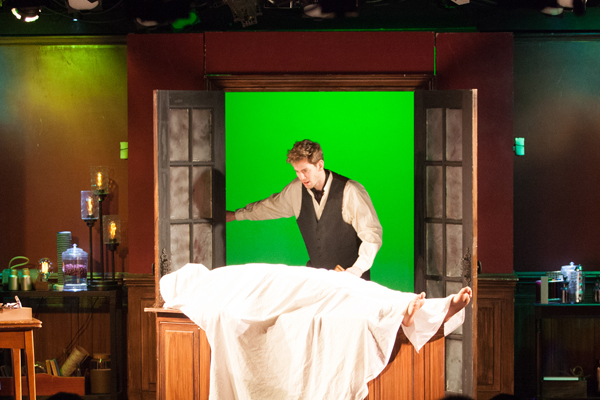 A new musical adaptation of Mary Shelley’s classic horror novel is now humming a ghoulish tune at St. Luke’s Theatre. Directed by Clint Hromsco, and with book, music, and lyrics by Eric B. Sirota, it’s an ideal opportunity to re-acquaint yourself with the 19th century masterpiece. If you’re not up to speed on Frankenstein, the novel was penned during a dreary wet summer in Geneva in 1816, famously referred to as “the year without a summer.” It was prompted by a story-writing contest, in which Mary Wollstonecraft Godwin (Mary Shelley’s maiden name), Percy Bysshe Shelley (her future husband), and Lord Byron challenged each other to write their own tale of a supernatural happening. Although all enthusiastically began to pen their stories, Mary Godwin was the only one to complete her work. An ambitious young scientist named Victor Frankenstein is bent on finding the secret of life and creates from excavated body parts a giant being who turns out to be a heinous monster. The Creature, who’s more powerful than his creator, rebels against him and makes his life a living hell. The strength of Sirota’s production is in its vibrant music. It takes the audience by the ears, starting with the opening solo “Victor’s Lament,” sung by Jon Rose, which acquaints us with the melancholy scientist. It gains more force with “Heartbeat,” performed by Rose and the Ensemble, that debates the principle of life and its moral complexities. More musical texture comes in Act 2 with “I Can Dream Too,” belted out by Rose, Erick Sanchez-Canahuante, and Stephan Amenta. Verse by verse, it underscores how Victor, his friend Henry, and the Creature are all dreamers in their own way. If these songs hit the mark, it’s the musical number “I Tried to Fly,” sung by Rose, that best captures the sentiments of the over-reaching Victor. Is he a modern-day Icarus who recklessly flies too high? Or like the biblical Adam as described in Milton’s Paradise Lost? And what of the acting? It was mostly good, even though one actor was still on script (more later on this). In fact, the director Clint Hromsco in a pre-show announcement from the stage told the audience to expect some hiccups during the performance as a recent cast-change and technical adjustments had been introduced to the production. That being said, Jon Rose brings a romantic presence to Victor Frankenstein and has the stamina to go the distance as the doomed scientist during this two-hour plus show. Amy Londyn, as Victor’s fiancée Elizabeth, is the epitome of devotion and selflessness, and comes equipped with velveteen tonsils. Erick Sanchez-Canahuante, as the misanthropic Creature, conveys an intriguing mix of primal emotion, desperate longing for companionship, and a lethal fury for his creator. 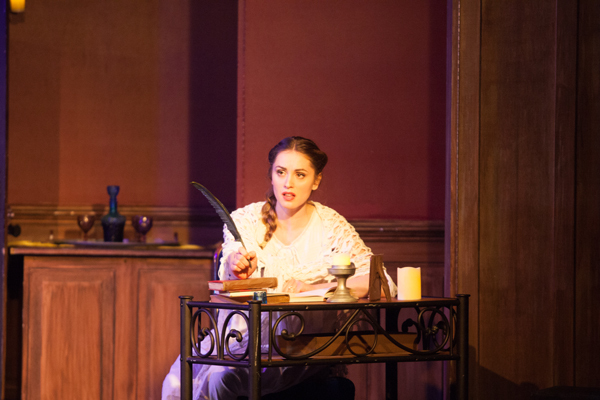 Even with script in hand, Sanchez-Canahuante is a stage-taker and has terrific musical chops. 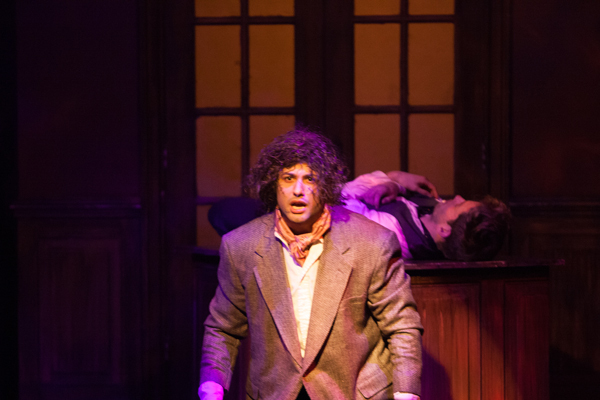 For the rest of the cast, Stephan Amenta brings out a hint of humor and swagger as he performs Victor’s friend Henry. And Stephanie Lourenco Viegas and Gabriella Marzetta get the job done as Justine and Claire. Admittedly, some scene transitions were clunky. But the striking visual tableaus on stage (set by Matthew Imhoff; lighting by Maarten Cornelis) compensated for the musical’s rough patches. By all means, don’t blink, or you’ll miss the Creature’s killing of Victor’s younger brother and the execution of the innocent Justine (accused and convicted of murdering the boy). It also skims over how the Creature learns language and tries to cultivate himself by surreptitiously watching a family passing their leisure hours at home. No, this isn’t a fully-realized vision of Shelley’s story. But has any stage or film production ever done justice to the classic? 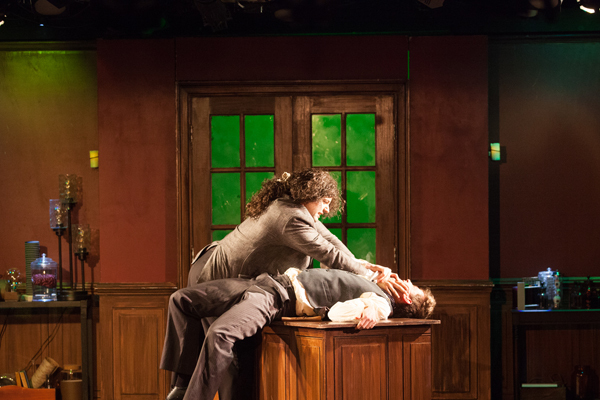 Indeed, this production primarily focuses on romantic love: the unconditional love that Elizabeth expresses for Frankenstein; and the adoration that Frankenstein feels for his soon-to-be bride. Naturally, this emphasis turns Frankenstein more into a love story than anything else. But it also effectively highlights that what the Creature longs for, above everything else, is a loving relationship with somebody of his own species. If the Frankenstein myth has been somewhat mangled over the years, it still has survived—and thrived--and continues to inspire artists today. In fact, this is the second stage production of Frankenstein in New York that I have seen in recent weeks, the first being Eve Wolf’s Mary Shelley’s Frankenstein, which was a blending of music, drama, and multi-media. No question that the earlier production (with Robert Fairchild as the Creature) had aural and visual appeal. But the current production, though it has no big names, is more coherent as a theatrical piece. All in all, the new musical Frankenstein is an ambitious theater piece that is refreshingly buoyed up by its music. If it doesn’t delve into all the nooks and crannies of the Frankenstein myth, it adds a new stripe to the horror story by underscoring the romance of Victor and Elizabeth. So why not go to this show with your sweetheart and discover together why Frankenstein has fascinated people for two centuries. For more information and tickets, phone 212-239-6200 or visit www.telecharge.com. Running time: 2 hours: 15 minutes, with one intermission.